Guitar Player Definition T-Shirt – YOU’LL HAVE SOME FUN WITH THIS ONE! 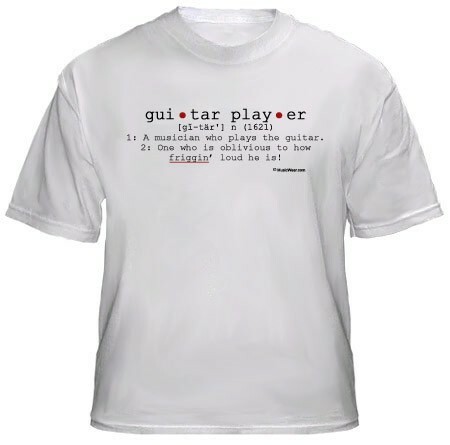 The Guitar Player Definition T-Shirt defines a Guitar Player as: “1. A musician who plays the guitar. 2. One who is oblivious to how friggin’ loud he is!”. You’ll love the fun that this guitar player tshirt stirs up! Quality Screen-printed, 100% pre-shrunk cotton T-shirts. Design on front of the t-shirt. White, 100% cotton. Professionally screen-printed. Available in MD, LG, XL, & XXL.